The T-14 Armata (Russian: Т-14 «Армата»; industrial designation "Ob'yekt 148", Russian: Объект 148) is a next-generation Russian main battle tank based on the Armata Universal Combat Platform—the first series-produced next-generation tank. The Russian Army initially planned to acquire 2,300 T-14s between 2015 and 2020. Production and fiscal shortfalls delayed this to 2025, and then to the cancellation of the main production run. The test batch of 100 is to be delivered and deployed to the Taman division, with delivery expected to be completed by 2020; tanks will be transferred only after the completion of all state tests. The T-14 Armata tank in the 2015 Moscow Victory Day Parade. 44S-sv-Sh Glacis: 900 mm vs APFSDS and 1400 mm vs HEAT. 2A82-1M 125 mm (4.92 in) smoothbore cannon with 45 rounds (32 of them in the autoloader). Future version may use the smoothbore 2A83 152 mm gun. The Armata was designed over the course of 5 years, and features a number of innovative characteristics, including an unmanned turret. The crew of three is seated in an armoured capsule in the front of the hull, which will also include a toilet for the crew. A T-14 Armata. The main gun is visible. The main armament of the T-14 is the 2A82-1M 125 mm (4.92 in) smoothbore cannon, a replacement for the 2A46 125 mm gun of previous Russian and Soviet tanks. According to Russian sources, its muzzle energy is greater than that of the German Leopard 2's Rheinmetall 120 mm gun, which is considered one of the world’s best cannons, as well as its main competition. The 2A82-1M gun is 15–20% more accurate, while also boasting a 70% increase in accuracy while moving compared to the older 125 mm cannons. Features include an absence of a fume extractor (due to the unmanned turret), a fire rate of 10–12 rpm (rounds per minute), left side casing ejection port for the 125 mm gun and a maximum effective-penetration range of 8 km with ATGMs. The 2A82-1M 125 mm cannon can fire a wide range of ammunition, including armour-piercing fin-stabilized discarding sabot (APFSDS) projectiles, guided missiles, high-explosive anti-tank (HEAT-FS) shells, air-burst HE-Frag shells and other types of rounds. The Vacuum-1 APFSDS round, developed for the 2A82-1M gun, has a penetrator that is 900 mm long, and is said to be capable of penetrating 1 m of RHA equivalent at a distance of 2 km. The new controlled-detonation Telnik HE-Frag shell is available and has entered service. The gun is capable of firing guided missiles like the 9M119M1 Invar-M which has an effective range of 100 m to 5 km, and can engage low-flying air targets such as helicopters,, with a new 3UBK21 Sprinter ATGM with an effective range up to 12 km developed specifically for it. The secondary armament consists of a 12.7×108mm Kord (GRAU index 6P49) machine gun with 300 rounds (not observed during the 2015 parade) and a 7.62×54mmR Pecheneg PKP (GRAU Index: 6P41) or a PKTM (6P7К) machine gun with 1,000 rounds. All guns are remotely controlled. In addition, another 1,000 rounds can be stored separately. A 12.7 mm machine gun is installed above the turret roof-mounted commander's sight, which avoids visual obstructions, while the turret front has a peculiar slit that is speculated to be intended for the coaxial 7.62 mm machinegun. 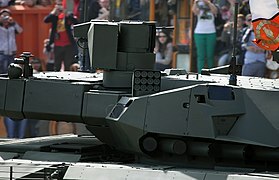 The tank’s turret might be fitted with a Shipunov 2A42 30 mm cannon to deal with various targets, including low-flying aerial targets, such as attack planes and helicopters. In the future, the T-14 may use the 2A83 152 mm gun instead of its current 2A82-1M 125 mm gun. The cannon, which was first developed in 2000 for the T-95 prototype, has a high-speed APFSDS shell with a 1,980 m/s muzzle velocity, only dropping to 1,900 m/s at 2 km. However, Russian engineers have so far kept the 125 mm-size gun, assessing that improvements in ammunition are enough to increase effectiveness, while concluding that a larger bore weapon would offer few practical advantages. The T-14 can also use anti-aircraft missiles. A 30 mm anti-aircraft gun may be installed in the near future. The T-14 is powered by a ChTZ 12N360 (A-85-3A) diesel engine delivering up to 1,500 hp. The engine's theoretical maximum power, not normally used, is 2,000 hp, at the cost of radically decreasing its service life, projected min 2,000 hours at nominal 1,500 hp, comparable to other modern tank engines, and up to 10,000 hours at moderated 1,200 hp. The engine is electronically controlled. Operational range is over 500 km. The T-14 has a 12-speed automatic gearbox, with a top speed of 80–90 kilometres per hour (50–56 mph) and a range of 500 kilometres (310 mi). At least one expert speculated that the transmission might be an electronically controlled mechanical gearbox with external reverse and demultiplier gears, giving the tank equal forward and reverse gear ranges. Other sources suggest a partly or fully hydrostatic transmission. Uniquely for a Soviet/Russian design, the transmission is joined with the engine into a single unit that can be swapped out in the field in just under 30 minutes. Unlike previous Russian and Soviet designs, such as the T-90/80/72/64, the T-14 has seven 700 mm road wheels per side, based on the T-80 variant. It has the ability to adjust the suspension of at least the two first roadwheels, and, probably, the last ones. In the 2015 Moscow Victory Day Parade rehearsal video, a T-14 Armata is shown retracting one of its frontal first wheels during turns. This, along with published design blueprints, suggest at least a partial hydraulic suspension system based on the adjustable lever arm shock absorbers that now double as suspension actuators. 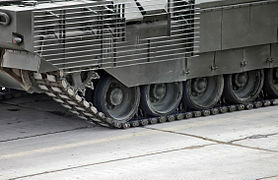 This may have been done to improve the pivoting ability of the tank, as an active suspension system improves the target lock time[clarification needed] by a factor of 2.2, and reduces the timeframe between target detection and reaction by 31%, all due to the resulting smoother ride. Much thought was given to the tank's strategic mobility. Its moderate mass of 48 tons allows it to be easily transported by rail or trailer, which conserves its engine and transmission's service life, and to cross the majority of bridges in Russia. Two T-14s with their crews and all attending equipment can be easily airlifted by the heavy An-124 transport plane. However, the most numerous Russian strategic airlifter, the Il-76, is only able to lift a T-14 and its needed equipment in its newest, PS-90-equipped variant. A Russian Army T-14 Armata tank in rehearsal for Victory Day celebrations. The T-14's crew of three is protected by an internal armored capsule with more than 900 mm RHA equivalent, increasing their chance of survival in case of a catastrophic kill. Both the chassis and the turret are equipped with the Malachit dual-explosive reactive armour (ERA) system on the front, sides and the top. The tank uses an integrated, computerized control system which monitors the state and functions of all tank modules. In battle, the software can analyze threats and then either suggest or automatically take actions to eliminate them, while without the external threat it can detect and rectify crew errors. Serial production of the Armata Platform's ceramic armor components began in mid-2015. The tank features the Afghanit (Russian: Афганит) active protection system (APS), which includes a millimeter-wave radar to detect, track, and intercept incoming anti-tank munitions, both kinetic energy penetrators and tandem-charges. Currently, the maximum speed of the interceptable target is 1,700 m/s (Mach 5.0), with projected future increases of up to 3,000 m/s (Mach 8.8). According to news sources, it protects the tank from all sides, however it is not geared towards shooting upwards to defend against top-attack munitions. Defense Update released an analysis of the tank in May 2015, speculating that Afghanit's main sensors are the four panels mounted on the turret's sides, which are probably AESA radar panes spread out for a 360° view, with possibly one more on top of the turret. In their opinion, the active part of the system consists of both a hard kill and soft kill element, the first of which actively destroys an incoming projectile (such as an unguided rocket or artillery shell), while the second confuses the guidance systems of ATGMs, causing them to lose target lock. They believe that it would be effective against 3rd and 4th generation ATGMs, including Hellfire, TOW, BILL, Javelin, Spike, Brimstone, and JAGM, as well as sensor-fused weapons (SFW). Some Russian sources claim the hard-kill APS is effective even against depleted uranium-cored armor-piercing fin-stabilized discarding sabot (APFSDS) rounds traveling at 1.5–2 km/s (0.93–1.24 mi/s), but others are skeptical, saying the fragmentation charge would not do much to the dense penetrator; while it might be able to push it off course somewhat with a hit-to-kill approach, it likely will not do much to stop it. According to a Russian Ministry of Defence source, practical tests confirmed the destruction of the uranium subcalibre projectile (goal speed up to 2 km/s). However, several outside analysts remain skeptical, as the feat has not yet been independently verified or even publicly demonstrated. Afghanit hard-kill launchers are the long tubes mounted in groups of five between the turret's front sides and the chassis. These send out an electronically activated charge that fires an unknown type of warhead towards the target. Many analysts currently assume it is some form of high-explosive fragmentation charge, but the possibility has been raised by other sources of the usage of a more solid warhead (possibly similar to an explosively formed penetrator), as seen in Russian patent RU 2263268. The tank is also equipped with the NII Stali Upper Hemisphere Protection Complex, which consists of two steerable cartridges with 12 smaller charges each, and a turret-top VLS with two more similar cartridges, corresponding to the vehicle's soft kill APS. Additionally, using the AESA radar and anti-aircraft machine gun it is possible to destroy incoming missiles and slow-flying shells (except kinetic energy penetrators). In July 2015, the deputy director of the Uralvagonzavod tank manufacturing company claimed the T-14 would be invisible to radar and infrared detection due to radar-absorbing paint and the placement of components with heat signatures deep within the hull. The turret's shape is designed to reduce its radio and thermal signature for a stealth ground vehicle. American and Russian armor experts have doubts about these unproven claims. A retired senior U.S. military officer said that sensitive modern thermal technology could detect things such as vehicle movement, a weapon firing, an exposed crewman, or the exhaust of an engine capable of moving a 50-ton tank regardless of heat-generating component placement. Analysts also pointed out that most stealth technology in Russia has been for aircraft to reduce their radar cross section from airborne or ground-based detection, while in a ground vehicle the approach would be to make it indistinguishable from ground clutter to optimize shielding from air-to-ground detection and the two techniques do not necessarily overlap. The T-14 is equipped with 26.5–40 GHz Active electronically scanned array radar, which is used mainly by the APS. Up to 40 airborne or 25 ground targets down to 0.3 m (12 in) in size can be tracked simultaneously. The tracking system provides an automatic firing solution for the destruction of the target, which can then be transferred to either the APS or the main gun control computers. The tank will be able to give target designation for artillery and serve in air defence and reconnaissance roles. The T-14 uses highly protected communication channels that connect a group of T-14s and the command post. The commander and gunner have largely identical multispectral image sights, with visible electromagnetic spectrum and thermography channels and laser rangefinders. The commander's sight is installed on the turret top and has a 360° field of view, while the gunner's, situated in the turret's niche to the gun's left, is slaved to it and is additionally equipped with a direct-vision periscopic channel and laser designator for the T-14's gun-launched, SACLOS anti-tank missiles. The detection distance of tank-sized objects for both sights is 7,500 m (8,000) in daylight, through the TV/periscopic channel, and ≈3,500 m at night through the thermal channel. There is also a backup night-vision capable sight, with 2,000/1,000 m respective detection distances. In addition to traditional vision periscopes, the driver has a forward looking infrared camera and a number of zooming closed-circuit television cameras. Video cameras are installed for all-round vision for the crew, since it lacks the normal vantage point of turret roof hatches. This 360-degree camera coverage is perhaps one of the T-14's most unusual features, made necessary because of extremely limited visibility without them. The crew, clustered in the front of the hull, would have poor situation awareness if the camera setup and video feeds were to fail. Although the T-14 is touted as an entirely Russian-made next-generation tank, some components may not be entirely domestically made. Cybersecurity analysts have stated that Russian industries have had difficulty producing critical components of night-vision systems which are standard on the tank, and have attempted to buy them from Western or Chinese suppliers in the past. This means components of the T-14 could have originated outside of Russia, and may be more difficult to obtain or produce due to sanctions against Russia for its involvement in Crimea and eastern Ukraine. An unmanned version of the Armata is planned and is currently in development. The tank was first shown in public during rehearsals for the 2015 Moscow Victory Day Parade. During the rehearsals, one of the tanks suddenly stopped moving, and after attempts to tow it failed, it moved away under its own power after about 15 minutes. The Russian Federation was expecting to order 2,300 new main battle tanks for delivery by 2020. In 2015, Russian media had announced that around 20 tanks had been delivered for testing, without naming a source, and at least seven T-14 Armata tanks appeared in the 2015 and 2016 Moscow Victory Day parade, five in 2017 and 2018. But in 2016 the Russian defence ministry announced that it had signed a contract for a “test batch” of 100 tanks to be delivered by 2020, with the full project extended until 2025. 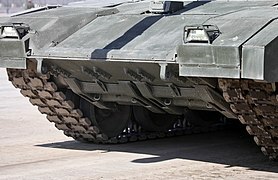 In July 2018, Deputy Prime Minister for Defence and Space Industry Yury Borisov said there is currently no need to mass-produce the Armata when its older predecessors, namely the latest variants of the T-72, remain "effective against American, German and French counterparts”, saying, “Why flood our military with Armatas, the T-72s are in great demand on the market(s).” Instead, a modernization program of the T-72s, T-80s and T-90s in-service will take precedent. In August 2018, at the ARMY2018 Forum outside Moscow, the Russian Ministry of Defense signed a contract for the purchase of 32 T-14s tanks and 100 T-15 infantry fighting vehicles, with delivery to be finished by 2021. In 2019 it was announced that the first 12 tanks would be delivered by the end of that year. 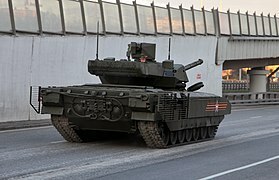 The T-14 Armata has been described as a major concern for Western armies, and British intelligence views the unmanned turret as providing many advantages. Western observers, however, question Russia's ability to purchase modern tanks like the T-90 and T-14 in significant numbers. In response to the Armata, German Rheinmetall AG has developed a new 130mm L/51 tank gun, claiming it provides a 50 percent increase in armor penetration over the 120mm L/55 in service with the Bundeswehr. Germany and France have joined forces to develop an unspecified "main ground combat system" (MGCS) to compete with the technological advances of the Armata and replace both the Leclerc and Leopard 2 MBTs around 2030. 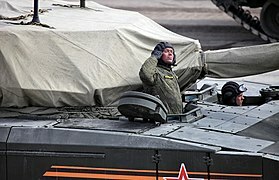 Denis Manturov, the Russian minister of trade and industry, said that Russia was ready to sell the Armata tank to Egypt. "Russia is ready to discuss with Egypt the delivery of the T-14 Armata tank after executing its plans for this new generation tank under the state armaments program," he told RIA Novosti on a visit to Cairo in May 2015. The manufacturer of the Russian Armata tank invited a delegation from Egypt to a military equipment and arms expo in Russia, where the capability of the new tank will be demonstrated. "We invited the Egyptian delegation to the exhibition of weapons, which will be held in September this year , to show what this machine is capable of," the company's director Oleg Sienko told TV Channel Russia-24. Vladimir Kozhin, a Russian presidential aide, said that Russia's foreign partners, including China and India, have expressed interest in purchasing new military equipment presented at the May 9 Victory Day parade in Moscow, including the Armata tank. "To a larger extent it is our traditional partners: India, China and South-East Asia," he told the Izvestia newspaper. Even though China has shown interest in the T-14, Chinese company Norinco claims their domestic VT-4 tank is superior to the Armata design in terms of mechanical reliability, fire control, and unit cost. T-14 during night time rehearsal of the 2015 Moscow Victory Day Parade. ^ "Die Presse: российская "Армата" знаменует революцию в танкостроении". РИА Новости. ^ a b c d e f g h i j k l m n o p q r s t u v "Танк Т-14 "Армата" или Т-99 "Приоритет"" [Tank T-14 "Armata" or T-99 "priority"] (in Russian). vpk.name. Retrieved 6 May 2015. ^ "Названа цена танка "Армата"". Popmech.ru. ^ "Названа цена "Арматы"". rg.ru. ^ a b c d "Pilot batch: Russian military get first T-14 Armata tanks". RT. TASS. 2016-09-06. Retrieved 2016-09-09. ^ "Russian Defense Ministry to get 100 Armata tanks Military & Defense August 24, 2017 The tanks are expected to be delivered before 2020". Retrieved 19 June 2018. ^ "The first 100 tanks "Armata" will be supplied to troops in 2017-2018 Подробнее на ТАСС:". Retrieved 19 June 2018. ^ "Минобороны закупило 132 боевые машины Т-14 и Т-15". РИА Новости (in Russian). Retrieved 2018-08-22. ^ a b "T-14 Armata main battle tank". Army Recognition. 9 August 2012. Retrieved 17 July 2017. ^ "Russia Created New Steel Armor for Armored Vehicles". Siberian Insider. 3 July 2014. Archived from the original on 8 May 2015. Retrieved 22 February 2015. ^ Bender, Jeremy (31 May 2015). "These are the plans for Russia's new third-generation tank". Business Insider Australia. Retrieved 18 January 2019. ^ Administrator. "T-14 Armata Russian main battle tank technical data sheet specifications information description pictures - Russia Russian army tank heavy armoured vehicles U - Russia Russian army military equipment vehicles UK". www.armyrecognition.com. Retrieved 9 April 2018. ^ a b c d e "БМП "Армата" сможет уничтожить вертолеты и беспилотники". ^ "Россия уже начала серийное производство смертоносного танка Т-14 «Армата»". versia.ru (in Russian). 2016-05-05. Retrieved 2018-03-30. ^ Majumdar, Dave (2016-03-13). "Surprise: Russia's Lethal T-14 Armata Tank Is in Production". The National Interest. Retrieved 2018-03-30. ^ "T-14 (Object 149) Armata Main Battle Tank (MBT)". GlobalSecurity.org. n.d. Retrieved September 14, 2016. ^ a b Lockie, Alex (15 March 2016). "Russia claims its deadly T-14 Armata tank is in full production". Australian Business Insider. Sydney, Australia. Retrieved 2 September 2016. ^ Diplomat, Franz-Stefan Gady, The. "Russia's Military to Receive 100 New T-14 Armata Battle Tanks". The Diplomat. Retrieved 2018-03-30. ^ a b Diplomat, Franz-Stefan Gady, The. "Russia Will Not Mass-Produce T-14 Armata Main Battle Tank". The Diplomat. Retrieved 2019-04-07. ^ "Russia: Two battalions of T-14 Armata MBT tanks will enter in service". Army Recognition: Global Defense & Security News. February 2018. Retrieved 18 January 2019. ^ "Первые "Арматы" получат таманцы". Izvestia. 2017-05-12. ^ a b c d e f ""Армата" против "Леопарда": новый русский танк превзойдет все мировые аналоги". ^ "Russia is installing toilets in the wildly expensive NATO killer T-14 supertanks it can't afford". 7 March 2019. Retrieved 23 March 2019. ^ Бойко, Александр (19 December 2014). "Танковые войска России переcаживаются на "Арматы"". Komsomolskaya Pravda (in Russian). Retrieved 6 May 2015. ^ a b c "Russia's new Armata tank on Army 2015 shopping list". Russia Today. 21 February 2015. Retrieved 19 April 2017. ^ Ukraine War Awareness. "NEW second unique footage of T-14 Armata Tank Firing UralVagonZavod 2016". YoutTube. Youtube. Retrieved March 1, 2017. ^ "Take Cover! Russian Armata Tank Gets New High-Tech Ammo Type - Sputnik International". ^ a b International, Sputnik (2015-04-26). "Russian T-14 Armata: Most Powerful Tank in the World in Details". Sputnik International. Retrieved 19 April 2017. ^ "Пушка Т14 пробивает до 2 метров гомогенной стали - youinf.ru - информационно-познавательный журнал YouMag". Retrieved 23 October 2016. ^ a b "Танк "Армата" получит 152-миллиметровую пушку" (in Russian). Lenta.ru. 19 December 2014. Retrieved 18 May 2015. ^ a b c d e Птичкин, Сергей (5 May 2015). "Ракеты собьют на подлете". Rossiyskaya Gazeta (in Russian). Retrieved 13 May 2015. ^ "Take Cover! Russian Armata Tank Gets New High-Tech Ammo Type". Sputnik. Retrieved 23 October 2016. ^ "Создан новый боеприпас для танка "Армата" - Еженедельник "Военно-промышленный курьер"". Retrieved 23 October 2016. ^ a b c d e f g Щеголев, Илья (23 January 2015). ""Армата" против "Леопарда 2" и "Абрамса"". Rossiyskaya Gazeta (in Russian). Retrieved 13 May 2015. ^ Mizokami, Kyle (2017-06-21). "Russia's T-14 Tank Can Outshoot America's by Miles". Popular Mechanics. Retrieved 25 September 2018. ^ "Антикризисная модель "Арматы"". svpressa.ru (in Russian). 10 March 2015. Retrieved 6 May 2015. ^ "Танк "Армата" усилят пушкой калибром 152 мм". EADaily. ^ "Рогозин: танк "Армата" оборудуют новой пушкой с мощным зарядом". РИА Новости. ^ Егор Созаев-Гурьев. ""Армату" сделают мощнее". Известия. ^ "Отечественные проекты танковых пушек" (in Russian). 19 March 2015. Retrieved 18 May 2015. ^ "История создания перспективного танка. "Русский "Тигр" Т-95"" (in Russian). 11 August 2013. Retrieved 18 May 2015. ^ "Т-95 / Объект 195" (in Russian). 1 May 2011. Retrieved 18 May 2015. ^ "152-мм пушка для "Арматы"" (in Russian). Retrieved 18 May 2015. ^ "Танк Т-14 "Армата". Инфографика". ^ Paul Richard Huard. "The T-14 Is a New Russian Tank —And a Whole Lot More — War Is Boring". Medium. ^ a b "Дизельный двигатель 12Н360". ЧТЗ-УРАЛТРАК (in Russian). ^ АО ИД «Комсомольская правда». ""Армата" - то что надо". АО ИД «Комсомольская правда». ^ a b "Танк Т-14 "Армата": технические характеристики". 6 September 2016. Retrieved 9 April 2018. ^ a b Литовкин, Дмитрий (9 May 2015). "Цена танка "Армата" вызвала споры" (in Russian). vestifinance.ru. Retrieved 9 June 2015. ^ "Танк Т-14 "Армата" или Т-99 "Приоритет"". ^ "Трансмиссия для "Арматы"". Gur Khan Attacks (in Russian). 2 May 2015. Retrieved 15 May 2015. ^ a b "Следующий – Т-14". Vzglyad (in Russian). 26 September 2013. Retrieved 17 May 2015. ^ a b c d "Активная подвеска танка "Армата"". Gur Khan Attacks (in Russian). 12 May 2015. Retrieved 17 May 2015. ^ "ТАСС: Армия и ОПК - "Армата" и "Курганец": от пульта для геймпада до искусственного интеллекта". ТАСС. ^ "ТАСС: Армия и ОПК - Серийный выпуск керамики для брони "Арматы" начался в Новосибирске". ТАСС. ^ Sputnik. "Can't Touch This! Russian Armata Tanks to Get New Active Protection System". sputniknews.com. Retrieved 9 April 2018. ^ a b c d e f "New Russian Armor; First analysis: Armata". defense-update.com. 9 May 2015. Retrieved 16 May 2015. ^ "«Армата» получила защиту от уранового оружия". 22 September 2016. Retrieved 9 April 2018. ^ "Системы активной защиты бронетехники". ^ "КОМПЛЕКС ЗАЩИТЫ ВЕРХНЕЙ ПОЛУСФЕРЫ". НИИ Стали (in Russian). ^ "Что представляет из себя танк Т-14 "Армата"?". ^ ""Армата" расстреляет снаряды противника из пулемета". Известия (in Russian). ^ "САУ "Коалиция-СВ" установила рекорд дальности стрельбы". ^ "На танки "Армата" установят радары с АФАР" (in Russian). army-news.ru. 23 January 2014. Retrieved 13 May 2015. ^ a b c "Russia's armour revolution". Jane's 360. ^ "Unmanned Robotic Armata Tank to Be Developed in 2018 - Russian Defense Ministry - Sputnik International". ^ "1st PHOTO: Russia's secretive Armata battle tank revealed". RT. April 21, 2015. ^ "Russia's New Tank Breaks Down During Parade Rehearsal". 7 May 2015. Retrieved 23 October 2016. ^ Press, Associated (7 May 2015). "State-of-the-art Russian tank breaks down at Victory Day rehearsal". Archived from the original on 12 December 2018. Retrieved 23 October 2016. ^ "Russia's new Armata tank on Army 2015 shopping list". RT International. Retrieved 2018-03-05. ^ "Минобороны заключило первый контракт на поставку свыше 100 танков "Армата"". РИА Новости (in Russian). 2016-09-06. Retrieved 2018-03-05. ^ "Путин не ставит на «Армату»". иноСМИ (in Russian). 2018-08-03. Retrieved 2018-08-10. ^ Kravchenko, Stepan (2018-07-30). "Tank Putin Praised May Be Too Expensive for Russia's Military". www.bloomberg.com. Retrieved 2019-03-11. ^ "Zamówienia na rosyjskie pojazdy Armata" [Orders for Russian Armata Vehicles]. defence24.pl. 2018-08-26. Retrieved 2019-03-11. ^ Mizokami, Kyle (2019-02-13). "Russia to Receive First New 'Armata' Tanks in 2019". Popular Mechanics. Retrieved 2019-03-11. ^ Majumdar, Dave. "Surprise: Russia's Lethal T-14 Armata Tank Is in Production". Retrieved 23 October 2016. ^ a b "UK military intelligence issues warning over Russian supertank threat". The Telegraph. 6 November 2016. Archived from the original on 11 November 2016. Retrieved 13 November 2016. Without hyperbole, Armata represents the most revolutionary step change in tank design in the last half century. ..revolutionary turret design that makes crew less vulnerable under fire. The tank is also reckoned to be lighter, faster and lower in profile than Western rivals. ^ "Putin's Got a Cool New Tank: How Many Can He Afford?". The Fiscal Times. 7 May 2015. Retrieved 13 November 2016. ^ Majumdar, Dave (7 November 2016). "Russia's Armata T-14 Tank Could Be Super Dangerous on the Battlefield (But There Is One Simple Problem)". The National Interest. Archived from the original on 10 November 2016. Retrieved 13 November 2016. ^ Administrator. "Rheinmetall future MBT main battle tank MGCS Main Ground Combat System with 130mm cannon 11802161 | February 2016 Global Defense Security news industry | Defense Security global news industry army 2016 | Archive News year". armyrecognition.com. Retrieved 2017-01-22. Wikimedia Commons has media related to T-14 Armata. New Russian Armor – First analysis: Armata: Defense Update analysis. Russia's armour revolution: Jane's analysis (archived version).